The flat Season begins this weekend with its traditional curtain raiser, the Doncaster Lincoln Meeting. Each year I like to compile a list of horses to follow for the Season and over the years it's proven to be a powerful, and profitable method of finding winners. For this years list I've been concentrating on the 7f-1m2f turf handicaps that took place last year to try and find some horses that should be worth following. After reviewing many, many handicap results and analysing multiple form lines I have come up with a shortlist of 10 horses. PETRUS – Brian Meehan (4yo): Decent 2yo who began his 3yo career with a rating of 101 but went the season winless in 9 starts. He began last year down the field in decent company but ran okay in the Britannia Handicap at Royal Ascot when beaten less than 7 lengths off a rating of 97. All his best form has come on Good to Firm ground including his best run last Season when 3rd of 15 in a class 2 handicap at Ascot off 93. He was unable to run to that level in 4 subsequent starts, mainly on softish ground, but begins this year from a career low mark of 91. Gelded at the end of last season he should be capable of winning decent races when getting the right ground. MEDIEVAL – Paul Cole (5yo): Begins this Season on a very attractive mark after a poor 2018 where he was winless in 12 races. He did run okay on occasions last year when slipping into the 80's and the handicapper has given him a real chance by starting him off for this Season from just 85. This will be the lowest rating he has ever raced off and is 1lb less than his last winning mark (September 2017). He races mainly over 7f-1mile but did finish second at Newbury over 1m2f . His record in class 4 handicaps is 1-2-2 and he should have no problem picking up a similar race this Season. CURIOSITY – Hugo Palmer (4yo): Won twice as a Juvenile before being outclassed, but not disgraced, behind Expert Eye in the Group 2 Vintage Stakes at Glorious Goodwood. Gelded at the end of that Season he returned last year to finish runner up in three tough handicaps and was very unlucky to bump into some seriously decent horses. He was second in the Britannia Handicap when giving 3lb to the winner Ostillio (subsequent Group 2 winner) and second to First Contact (subsequent Listed winner and Group 1 third) at Newmarket on his last run of the Season. He looks like a very decent handicapper who is my current long term fancy for this year's Hunt Cup. As I said earlier, I have 10 horses on my Handicappers to Follow List to kickstart the Flat Season. The 10 Horses range in age from 3-6yo and all have been campaigned around 7f-1m2f. I'm very hopeful that they will provide us with plenty of winners during the first half of the Flat Season. But they form only part of the Notebook Horses Service as each Sunday (until 1st June) I will be reviewing that weeks 7f-1m2f handicaps to try and spot other noteworthy horses to add to the list. Members will receive my full write-up along with all additions to the list. Members will also receive Email Notification whenever we have a runner. There's no need to scour the daily papers looking for the horses, I'll do everything for you! 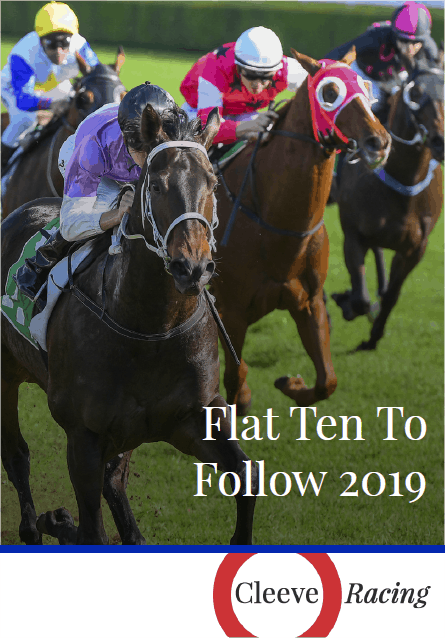 To get the full list of 10 Horses to Follow (handicaps) for 2019 and my weekly horses to follow feature posts PLUS full Email Notification whenever there is a runner sign up below.